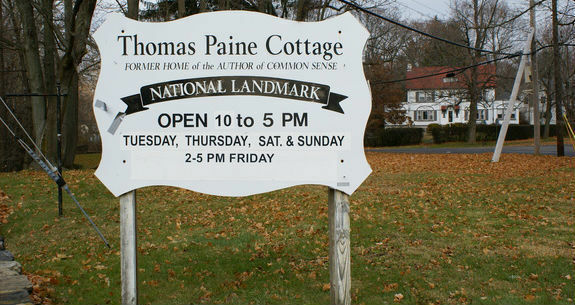 The Thomas Paine Cottage is the last structure in North America that the Founding Father owned as his home and is open to the public as an historic house museum. The Cottage contains some of the few artifacts still in existance that were once owned by Thomas Paine: a simple chair and a cast-iron stove given to Paine by Ben Franklin himself. The Cottage is located on the last two acres of a 300 acre farm awarded to Paine by a grateful New York State for his services in the struggle for independence. The site also includes the Sophia Brewester One-room Schoolhouse, the oldest free-standing school in New Rochelle. The front room of the Cottage is set up to reflect what life was like during the 18th century. It is used as a hands-on activity room for school groups and special programs, using original and reproduction artifacts. An upstairs bed chamber reflects early 19th century life with its rope bed, trundle bed, nightstand with candle, Bible and spectacles, washstand, handwoven period coverlet and young girl's cross-stitch sampler dated 1804. Other rooms contain permanent exhibits. One reflects the Huguenot settlement of New Rochelle. This exhibit contains the original 1689 deed to purchase the 6100 acres that became this city, and a rare breech-loading swivel gun (a small cannon) that was used in defense of the Huguenot city of La Rochelle during the 1627-28 siege in France. Another exhibit reflects our local history during the Revolutionary War. This exhibit contains original artifacts from that period. Still another room houses exhibits reflecting our native Siwanoy Indians, the Civil War, the formation of local services such as police and fire departments, famous New Rochellians and more. Temporary exhibits have included, "International and Historic Currancy", "The Railroad Comes to New Rochelle", and "New Rochelle in World War II". We are planning and gathering information and artifacts for"The Civil War to Civil Rights: The Black Experience in New Rochelle." A knowledgeable guide will take you on a personal tour, answering your questions while telling you the story of our site, the history of Thomas Paine, Colonial life and the Revolutionary War, the history of the Huguenots in New Rochelle, and the history of New Rochelle itself.